I have a potato soup recipe that I really like. It's comfprting, warming and tastes great, plus it's really quick which is very appealing. That being said, when I saw Elly post this, telling readers that we need this soup in our lives, I believed her. You can never have too many soups in your life, right? I am so glad I believed her and made this recipe. My only regret is not making it as soon as I saw it. Rob isn't a huge soup fan (minus Tomato Soup), so I generally know that when I'm going to make soup it'll just be me eating it. And when I sampled this soup before packaging it in individual containers for lunches, I was immediately excited that he doesn't like soup. The entire crock-pot was all mine!! Without a doubt, this soup is fantastic and a must try if you love potato soups as much as I do. It's a little more work than most slow cooker recipes, but the extra work pays off. There is a reason why I'm still craving a bowl of this soup right now, after all. It is creamy, full of flavor and you won't regret making it. Cook the bacon in a skillet over medium heat until crispy. Transfer to a paper towel-lined plate and refrigerate until serving. Pour off all but 2 tablespoons of the fat. Add the onion and cook over medium-high heat until softened and lightly browned. Add the garlic and thyme, and season with salt & pepper. Cook until fragrant, an additional minute or so. Stir in the flour and cook, stirring constantly, for about a minute. Slowly whisk in 1 cup of the chicken broth, scraping up any browned bits. Cook until the mixture is starting to thicken, then transfer to the slow cooker. Stir in the remaining broth, potatoes, 3/4 teaspoon of salt, and 1/2 teaspoon of pepper. Cover and cook until the potatoes are tender, 4-6 hours on low. If you need to leave the slow cooker longer, say if you're away at work all day, it will be fine, just cut your potatoes in to about 1" pieces. Transfer 3 cups of the slow cooked potatoes to a medium bowl with half and half and mash until smooth. Return the potatoes to the slow cooker, along with the shredded cheddar and sour cream. Stir to combine and let the soup sit until heated all the way through, about 10 minutes. When ready to serve, microwave the bacon on the plate until hot and crispy, about 30 seconds. Season the soup with salt & pepper as desired. 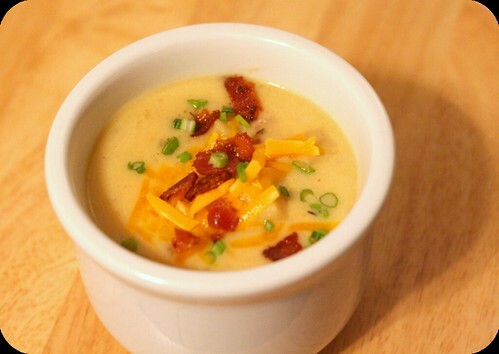 Once in bowls, top with bacon, shredded cheese and scallions.